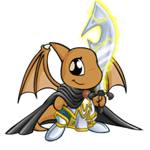 Hello, Neopia! Today I will be sharing my top blue Neopoint and Neocash wearables with you! Everything listed in this article will be at least 75% blue.